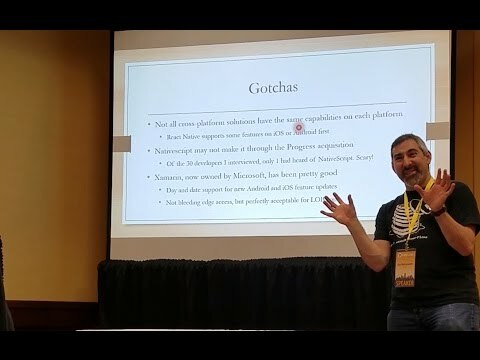 Here's a link to my presentation from Indy.Code() on native development versus "native cross-platform". Enjoy, and please provide feedback! Should you write your app “native” or use a “cross-platform” solution like React Native, Xamarin, or NativeScript? The new wave of native-cross-compiling solutions provide significant cost savings, code reuse opportunities, and lower technical debt. Does wholly native, per platform development, still play a role in future mobile development? Let’s discuss together.